Breakbulk and project specialist Europe Caribbean Line (ECL) has relocated its UK call from Ipswich to Hull, exporting over 300 tonnes of heavy vehicles and industrial components to Guyana, Suriname and Trinidad on its first call in Humberside. 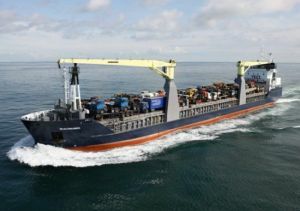 Represented by Baltic and European Shipping, part of the Kestrel Group of companies, the operator said the move would bolster customer accessibility in the Humber, Midlands and Northern regions. Baltic & European operates its National Marine and Port Services Centre from the nearby Waterside Business Park in Hessle. Humber based Global Shipping will handle stevedoring of the King George Dock based operation. ABP Humber director, Simon Bird, added: “We’re pleased to welcome new trade to the Humber as we continue to unlock new trading links to international markets. It’s also another example of where ABP’s unique network of 21 ports has been able to accommodate our customers’ changing requirements – in this case, moving from our operation in Ipswich, to our operations on the Humber.